No one gets married, with the intention of one day divorcing their spouse. Being confronted with an impending divorce is hard. You are never quite sure what you should or shouldn’t do in order to avoid making a Maryland divorce mistake that could potentially harm your overall case. If you are considering obtaining an absolute divorce, and you want to avoid common problems that plague many divorcing couples throughout Maryland, check out the following list of tips to help you navigate smoothly navigate the Maryland divorce process. Do not resume intimate relations with your spouse. Letting go of years of emotions and memories is difficult. However, do not allow your memories and feelings to lead you back into your estranged spouse’s arms. Resuming an intimate relationship with your spouse during your divorce may cloud your judgment and will likely result in you making misguided choices. Do not resume intimate relations with your spouse unless you both mutually agree to reconcile. Do not begin dating before your divorce is final. Until your divorce is final, you should avoid becoming romantically involved with anyone. Your spouse may use your new relationship against you during the divorce process, and it may become more difficult to deal with your spouse during this process. Do not make oral agreements with your spouse. Many divorces can, and do end amicably. Even if you believe that you and your spouse are in agreement regarding custody, marital property, alimony, and child support, and any other related issues concerning your marriage’s dissolution, formalize your agreement. By writing down your agreement, you can ensure that you both are on the same page. A written, signed, and notarized agreement is enforceable under the law and could help fix any problems should your relationship sour in the future. Do hire your own independent attorney to protect your interests. Even if you believe your divorce is going to be friendly and easy, you need an attorney. More specifically, you need your own attorney. Hiring an independent attorney will help you to understand your rights and how to protect your interests. Your attorney knows the law, knows what problems to avoid, and will help guide you through your divorce. Be completely honest with your attorney. Your attorney can only work with the information you provide. If you fail to disclose important information during your case to your attorney or if you mislead her regarding essential facts of your case, you will place yourself at a severe disadvantage that may cause irreparable harm to your case. Be open and honest with your attorney, regardless of the issue. Consult with an Experienced Maryland Divorce Attorney to Avoid Common Maryland Divorce Mistakes in Montgomery County, Maryland and Prince George’s County, Maryland. The attorney you hire to assist you through your divorce is your advocate. Your attorney should guide you through the Maryland Circuit Court system, and help you avoid common Maryland divorce mistakes along the way. A divorce can be a difficult time for you and your family, the divorce process can be less painful for everyone with a diligent and experienced family law attorney on your side. The New Year is about transformation and new beginnings. If you want to throw out the old baggage of your current relationship, and start the New Year with a fresh start we can help. If you have other questions or concerns about Maryland divorce mistakes or other questions regarding any other divorce, custody, or family law related matter, please contact The Law Office of LaSheena M. Williams, LLC today. 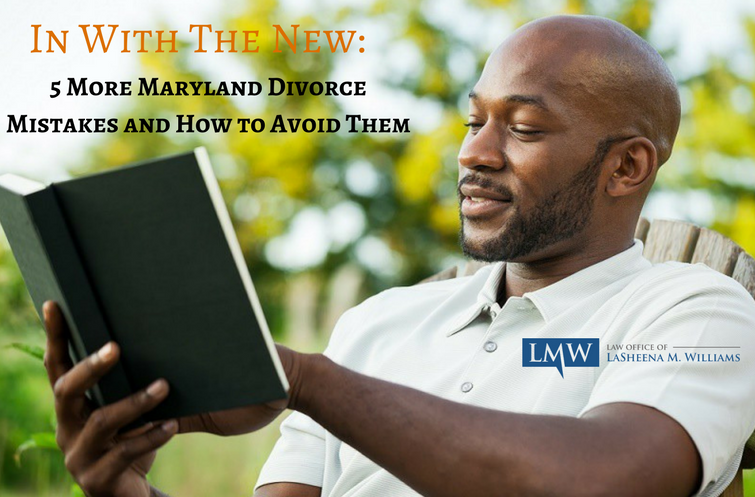 If you want to know more about how to safely avoid Maryland divorce mistakes, you can reach attorney LaSheena M. Williams at (301) 778-9950 or by leaving an online request for a consultation.